A European project aims to make life easier for amputees by developing a robotic orthosis with an artificial cognitive system. The EU Commission-funded CYBERLEGS Plus Plus programme was launched in January 2017 with the aim of validating the technical and economic viability of the powered robotic ortho-prosthesis developed by in the preceding CYBERLEGS programme. Its objective is to reduce the physical and cognitive effort resulting from using a traditional prosthesis. 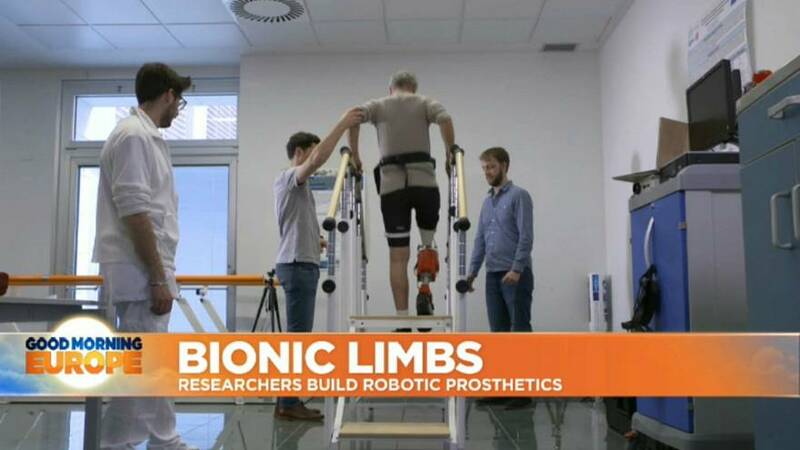 Daniele Bellini, who lost one of his legs 15 years ago in a farming accident, is one of the volunteers taking part in the programme at the Bio-Robotics Institute in Pontedera, Italy. After only two sessions with a prototype, he's now able to climb a staircase step by step. "With the prosthesis I usually wear, this is not possible (and) I have to stop at every step, it does absorb the shock but it doesn't give me the power needed to go up the stairs," Bellini told Euronews's Cyril Fourneris. Joost Geeroms, a mechanical engineering researcher at partnering institution Vrije Universiteit, in Belgium, explained that seven sensors are placed on the prosthesis and the leg of the volunteer. "We are measuring what the limbs are doing exactly, where they are and how they are moving (and) based on the information we compare to the model, we know if the user is walking, if he wants to take stairs or if he wants to stand up from a seated position," he said. Researchers are now hoping that if the good results from the prosthesis and a pelvis exoskeleton they are also trialling are confirmed, the two devices could be marketed in the coming years. A bionic hand, which could help quadriplegic people to catch objects, is also in the works. For scientists, the application of the technology could be wide-reaching. Nicola Vitiello, associate professor at the Bio-Robotics Institute explained: "you know that you are developing enabling technologies that can be somehow used also in other domains, like with other kinds of patients in the healthcare domain or in industry, to relieve workers from excessive fatigue."